While Kevin Gausman came into the year as the more highly touted prospect from Colorado, some scouts believe Walter will end up being the better of the two. He’s a giant at 6-foot-6 and 220 pounds. Because of his size he sometimes has timing problems in his delivery, but he’s a good athlete with clean mechanics for the most part. He hasn’t shown the same velocity as Gausman, pitching at 88-90 mph with some sink and touching 92, but scouts believe it’s in there. Walter has shown the ability to spin two different breaking balls, in a power curveball and a hard slider. They’re distinctly different pitches and both show the potential to be above-average. He doesn’t throw many changeups at this point, but that’s not uncommon. Walter is committed to Boston College but may not get there, as he’s getting fourth- to sixth-round buzz. Keith Law at ESPN (Insider Only) also provided a report on Walter prior to the draft, noting that Walter threw 85-90 in front of scouts while pitching for the second time in five days and comparing him to Anthony Ranaudo if he ended up following through on his BC commitment. The Phillies signed Walter right before the signing deadline for $350K. 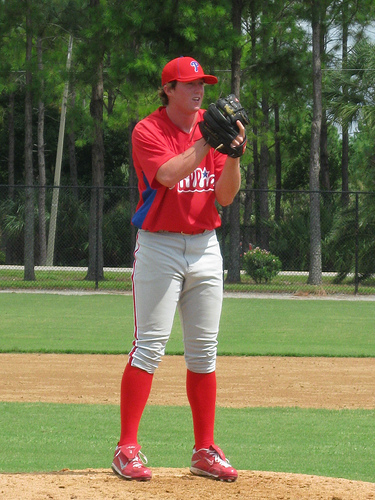 Career Synopsis: Due to his very late signing, Walter made a single appearance pitching two innings for the GCL Phillies. He participated in the Florida Instructional League after the season. Summary: Walter is refined for an 18 year old prep pitcher, with a prototypical power pitcher build. His fastball is currently just average in terms of velocity, but he can cut and sink it and it plays up because of his advanced command for his age. Both of his secondary pitches are at least average now, with a chance for more. If he fills out physically, he could unlock more velocity and end up sitting in the 92-95 range. Upside: Walter was part of a trio of high schoolers that the Phillies signed for $300K+ right before the signing deadline when they couldn’t reach deals with 5th round pick Scott Frazier. Walter was the highest drafted and most highly-regarded of the three. He possesses a decent repertoire of pitches. His advancement as a prospect is likely going to depend on him moving his fastball from a fringy 90-91 to a more consistent 93-94, although, in all honesty, this assessment is based solely on the limited scouting reports from prior to the draft. As a projectable HS pitcher, a full year in the system and some actual game action at Williamsport later in the summer will give us a better idea of what Walter’s upside is. UPDATE: After 64 appearances between 2010 and 2014, Walter was released 5/6/2015 after 6 more appearances with Clearwater. He surfaced in Independent ball for the Joliet Slammers of the Frontier League where was equally as bad as he was in Clearwater.